With the Kentucky Derby just a few days away, there are a lot of visitors in our fair city. We locals have ideas about where Louisville’s hotspots are, where the best restaurants are located, or the places worth spending time in. But what about the tourists? Enter data artist Eric Fischer, who compiled and mapped more geo-tagged tweets than we can imagine using an archive from Gnip, Twitter’s enterprise API platform (dated September 2011 through May 2013). Fischer looked at a user’s recent recent geo-tagged history to make an educated guess about whether specific tweets were from locals (blue) or tourists (red), creating a map called “Locals vs. Tourists” on the Mapbox platform—for the entire world. So we, of course, zoomed in to Louisville. As you might expect, most tourist tweets are centered in Downtown Louisville where thousands of hotel rooms, plenty of attractions, and the convention center have created their own sort of city of strangers within a city of locals. The map here glows bright red. Some of the popular tourist destinations include the Galt House, the convention center, and Fourth Street Live! On the eastern side of the above map, locals clearly dominate the scene along Baxter Avenue and Bardstown Road. Nulu, still just getting its footing back in 2011 when the data was collected is only a blue linear blip. Moving south, we expected Churchill Downs to be lit up like it was on fire, but it only glows slightly red. Sports facilities at the University of Louisville are strongly blue for local. To the east, the red picks up again at the fairgrounds. Most vividly, though, is the outline of the terminal building at Louisville International Airport, which stands out like a red wishbone. Notably on the local side, Old Louisville, or probably more accurately the University of Louisville, is a Twitter hotspot. Most of the outlying areas of Louisville are blue for locals, but red tourist tweets again surface at Mall St. Matthews and Oxmoor Center on Shelbyville Road. When the mall’s the only major shopping in town, it appears both locals and tourists will head over and tweet about it. Downtown St. Matthews is solidly blue. Finally, zooming out to a regional level, take a look at how other cities ranging from St. Louis on the left to Columbus on the right shape up compared to Louisville. So what can we learn from these maps? On the surface, we can begin to understand how people—both tourists and locals—are using our city. It appears tourists are predominantly sticking to the parts of town designed to be tourist friendly and missing out on some of the best local Louisville has to offer. Can we do a better job of spreading the word about some of the city’s hidden treasures? Or are they isolated without cars and no transit option with which to get around? We can also begin to understand where average Louisvillians are going to be social—at least digitally social on Twitter. It’s clear that the malls are dominant features on Louisville’s tweet landscape. Will increasing retail in Downtown or elsewhere help give other areas a boost? Downtown in general could certainly stand a few more tweets to fill in the white space. In a similar fashion, it would also be fascinating to see these maps updated with modern geo-tagged tweets to give a sense of the social media evolution of place. Downtown and Nulu would likely be much more colorful, and maybe Churchill Downs would stand out a bit stronger than it does here? 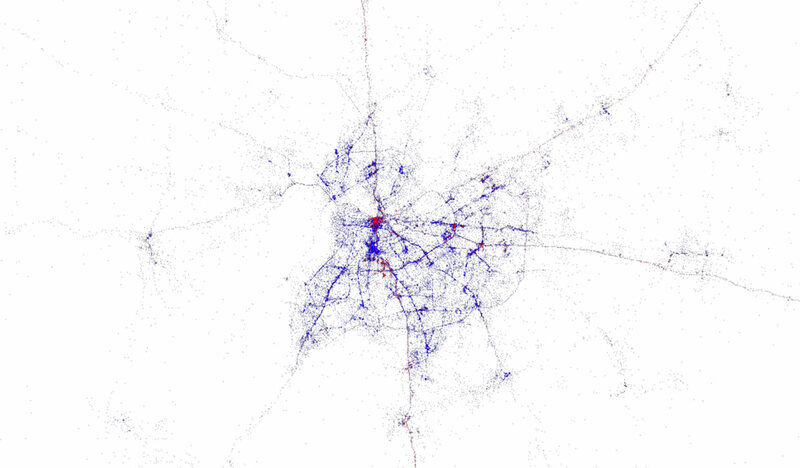 What observations do you see in these social media maps of Louisville? Share your thoughts in the comments below.